This image is a composite of hundreds of raw frames affected by dust. This situation should be avoided! In order to remove the shadows of dust that ruin your images, you can use two techniques. The first requires some steps to be taken just after your imaging session. Otherwise, don't worry because you can still use the second technique in Iris. However, first read the following instructions for next time. The combined use of both techniques is a formidable weapon against dust! This video is recorded immediately after your imaging session and without changing the optical configuration of your setup (accessories, webcam,...). The flat-field video records the shadows of dust that were previously set down on the glass protecting the sensor of the webcam. 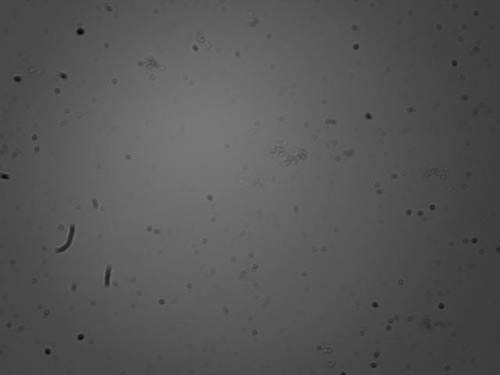 An image from the flat-field video. As you can see, the sensor was really dirty! I'm not guilty because I bought this webcam in poor condition from an amateur astronomer. 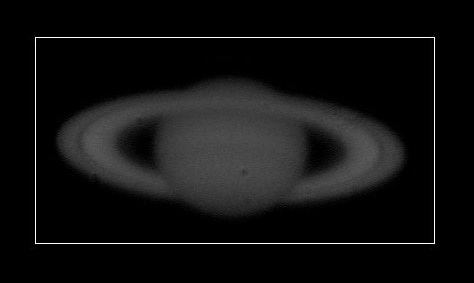 Before imaging Saturn, I didn't know there was so much dust on the sensor! To learn how to make a good flat-field video, click here (soon available). I propose two ways to process your flat-field video. The first is the fastest, the second is more rigorous. Choose the one you prefer! 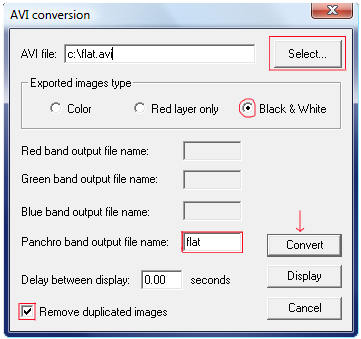 Go to the submenu "Avi conversion" on the menu "File". Enter first the path of the working directory for your flat-field .avi file. For example: « c:\flat.avi». If your video is in B&W, check the option « Black&White » in the type of images exported. 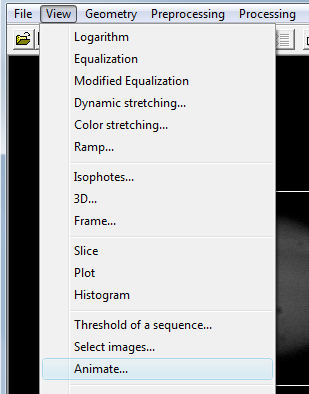 At the "Panchro band output file name" option, give the name "flat" to the video which will be produced. 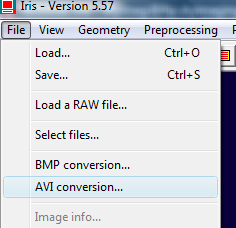 Check the "Remove duplicated images" box so that Iris does not take account of identical images created by the computer when it was in saturation. Then click on "Convert". 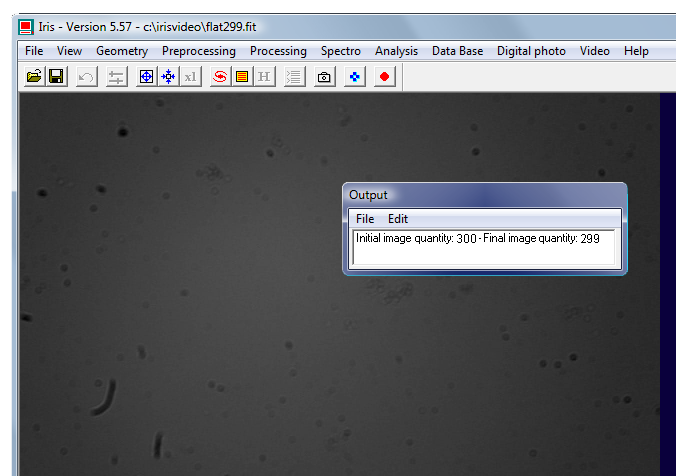 After converting the images, Iris shows the number of final images in the output window (here there are 299). Now use the command window to launch the following instructions. Add the flat-field images together with the "add_norm" command (there are 299 images in my example). Then multiply the "FLAT" by a value that is at the same level as the globe of Saturn, thanks to the command "mult" followed by a ratio below 1. Then use the window setting thresholds display with the mouse to balance the image (window at the bottom right of the screen). Click on the flat-field image to see that the level "i" is normalized with the level of Saturn. A more rigorous approach is the creation of a median flat-field that requires an offset, in addition to your flat-field video. To learn how to make a good offset video as well as the median flat, click here (soon available). Note : To find the coefficient divisor, 231 here, you can also run the "stat" command on the "FLATEND" image and note the value of the median. This is the divider ratio to be used for the flat-field division. Conclusion : it works although it isn't perfect! Dust on the sensor is smaller.  "bw" the name of the input sequence.  "FLATEND" the image to substract to the input sequence.  "bwflat" the output sequence you get after running the "div2" command.  "231" the level of FLATEND and the center of Saturn, which is the divider ratio of the « div2 » command.  "1199" the number of images of the input sequence. If some dust remains or you have not prepared to use the first technique , you have to make a "virtual" flat with Iris. If you are happy with the result you got with the "real flat" in the first technique and you don't feel the need to use the second technique to improve your image, go back to the previous page by clicking here. You can use this technique only if you have a small shifting (a few pixels) of the planet along the video. If you have a very high quality mount the planet won't move on the sensor and the "flat" command will produce bad results. The solution is to shift the planet on the sensor during the acquisition time of the video. This technique doesn't work with the Moon. Normalize the background of the sky on the images of the planet. The principle is to choose a reference area of the image by selecting a small square in the bottom of the sky (the goal is to avoid the alteration of the useful part of the image thereafter, the planet) with the mouse, and setting up the normalization of the sky in order for it to become well black. This will help you with the further stages of flat-field processing. You can use one of the 3 following methods, the last one being more rigorous. Enter the input generic name of the start sequence of images for which you've already made the "real flat" correction: "bwflat". 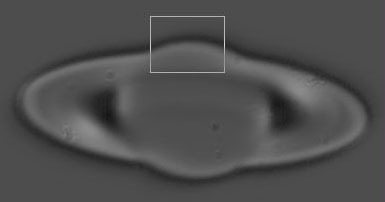 If you didn't make a flat-field video just after your imaging session and you have a problem with dust, choose the sequence "bw" from the beginning of the tutorial. The normalization value is set to 0. The output generic name is "bwflat_offset" and the number of images is 1199 (value to adapt to your video). Check the box «selected area» (to do this, you had to previously draw a small square in the background of the sky). Wow, you get your video with a uniform sky! Start by drawing a small square in the background of the sky. Then use the command "noffset3" directly from the command window of Iris . It is equivalent to the first method. If you used method number 2 to get a "real" flat-field, you always have the flat median to normalize the sky's background. 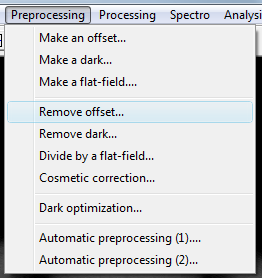 Go to the submenu "Remove offset" from the menu "Preprocessing". Note : Iris needs the file SHIFT.LST to do the virtual flat-field, because it has to know the shifts in X and Y of the planet along the video. You can create it with the "PREGISTER" and "CREGISTER" commands. "Performs the registration of [NUMBER] planetary images having the generic name [IN] using an intercorrelation method. The size for the intercorrelation is given by [SIZE]. It must be a power of 2 (128, 256, 512...). The size should be larger than the planet diameter. [OUT] is the generic name of the output images. First use PREGISTER to define a selection rectangle around the planetary disc (drag with the mouse). Note that the size of rectangle is not important (the rectangle marks only the center of interest of the image)". 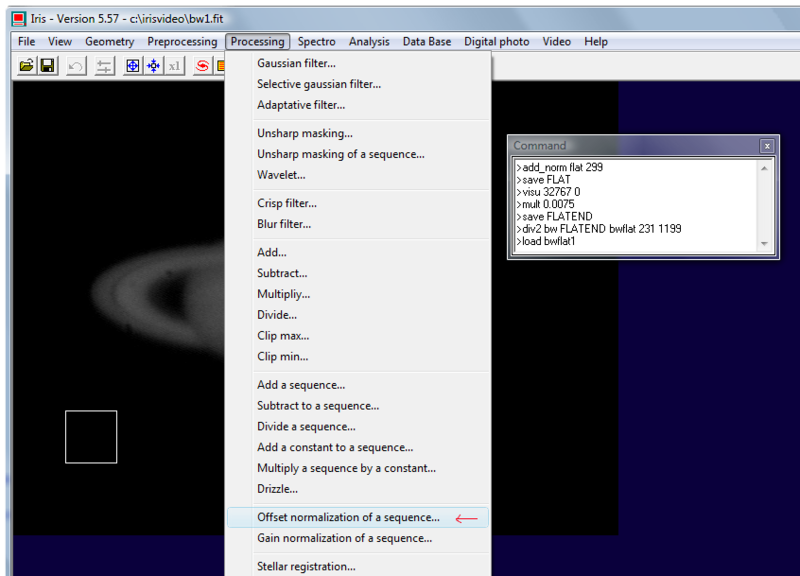 Thus, first select a frame around Saturn (or around a lunar crater), then run the command "pregister". 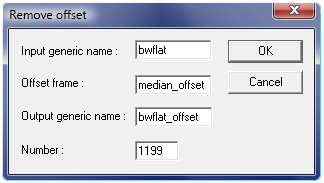 The output sequence is "bwflat_offset_registered". Then select the best images of the non-registered sequence (command "BESTOF") and rank them according to their quality (command "select"). Thanks to this method, the virtual flat-field you get with the "FLAT" command will be efficient as this instruction accepts only 100 images to calculate the virtual flat-field. If the images have been mixed, the first 100 will be more heterogeneous than those on the output sequence, so that the "FLAT" command will be more effective. This command looks at everything on the globe of Saturn that remains fixed on the 100 images, so if Saturn moves a lot, more dust will be detected. Note: Select first a rectangle around Saturn with the mouse before launching the "bestof" command. You should always use the "32767" and "0" values (the max and min levels accepted by Iris). "231" is the level of the flat-field image that will be produced by the "flat" command so you can then apply a flat-field correction to the images of your planetary sequence. 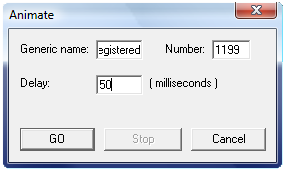 This is the same number that I use since the beginning of the processing. "3" is the number of iterations chosen to run the "flat" command and 100 is the number of images that can be taken into account. Note: Wait (with the egg timer), don't worry if nothing seems to happen. The flat-field image is coming soon! Don't forget to save it on your hard disk with the "save" command. It's now time to do the most painful step because you have to clean the image : only dust specks have to be seen and nothing else! You should remove any residual contour of the disk of the planet. Use the command "FILL2": first you draw a rectangle with the mouse around the area you want to delete, then you run the command "fill2" (dozens of times, with different sizes of rectangles). The operation takes about 10 minutes, because there are many small areas to remove around each dust speck. Nota: Note: If you want to throw your computer out the window, this is normal. However, keep patience, thinking that you can get by now! Draw a rectangle before erasing an area with "fill2".  Example of a bad result (I show here only the useful area of the image). Only the area circled in red is correct, as it delimits dust very well. Syntax: fill2 [level] with "level" the level of the virtual flat-field you got previously thanks to "stat". Here is a good virtual flat-field! Check the virtual flat-field on an image of the non-sorted sequence (but for which you have removed the offset signal of the camera) "bwflat_offset" obtained just before the step of creating the virtual flat-field. Note : 231 should match the value of the median provided by the STAT command on the photo VIRTUAL_FLAT_END. See if there is an improvement. 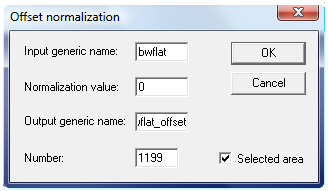 Test the final virtual flat-field on several images of the sequence "bwflat_offset. If the virtual flat-field doesn't work, delete still areas with "fill2" or repeat the process until the virtual flat-field is useful. With "bwflat_offset_end" the sequence produced after division by the virtual flat-field. A window appears showing the progress of calculations ... be patient. >load bwflat_offset1 (first frame of the sequence, processed with the "real" flat-field, only for those who have used the first technique). >load bwflat_offset_end1 (first frame of the sequence, 2 flats which have been used: the real and virtual). The improvement is not negligible. The virtual flat-field produced by Iris has only been used to eliminate the shadows of dust on the globe of the planet, because of the poor quality of the virtual flat-field obtained after the fast cleaning step (with "fill2"). A more rigorous cleaning would have given better results. The waste will be eliminated automatically by Iris at later stages of processing. Note: The result could be even more effective if I used my "excellent virtual flat-field". Here, I simply use my not-so-good virtual flat, therefore the difference between the step with the real flat-field and with the virtual flat-field is not very big. Several times, I wasn't able to make real flat-fields (I forgot to make a video of dust ...), and I must say that the technique of virtual flat-field in Iris is very powerful in these cases !